I just finished a weekend of fishing at the Battenkill an hour north of Albany. 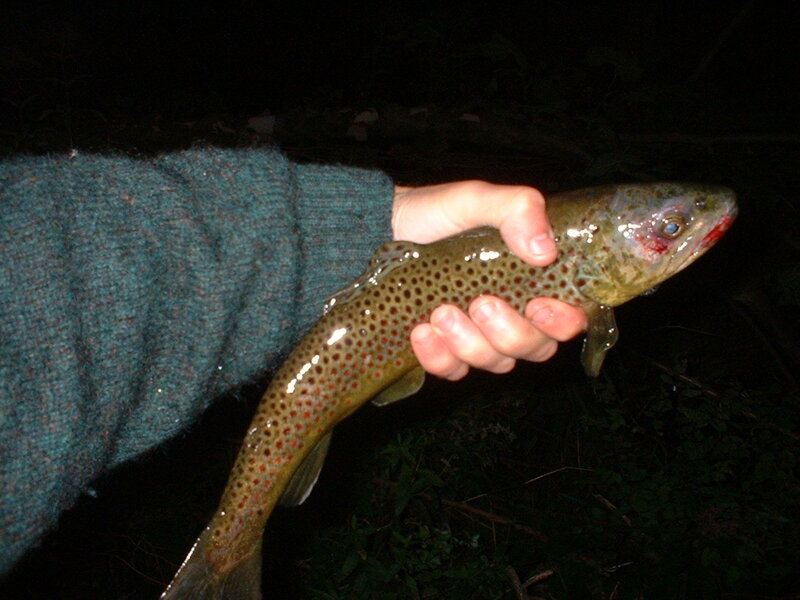 We managed to catch 15 trout or so in all, and had a couple of good fish feasts. At one spot, I couldn't find any fish, but I came across some chicken mushroom growing in the woods to supplement the trout feast. Yum! A DEC worker stopped by and asked me a few questions, and he showed me how you can tell which fish were stocked. They clip a fin off the fish, and for each season they clip a different fin so that they can tell which season it was stocked. He said that they stock lots of 9 inch trout, and a smaller number of 15 inch trout. You can tell that a fish was stocked if one of it's fins is either missing, or noticeably smaller than it should be. I also caught a fish that had some unpleasant redness around it's eyes and mouth. I emailed the picture to the DEC, and got a quick response explaining that this is "very typical hook wounding with damage around the mouth and eyes" after a previous "bad run in with a hook".